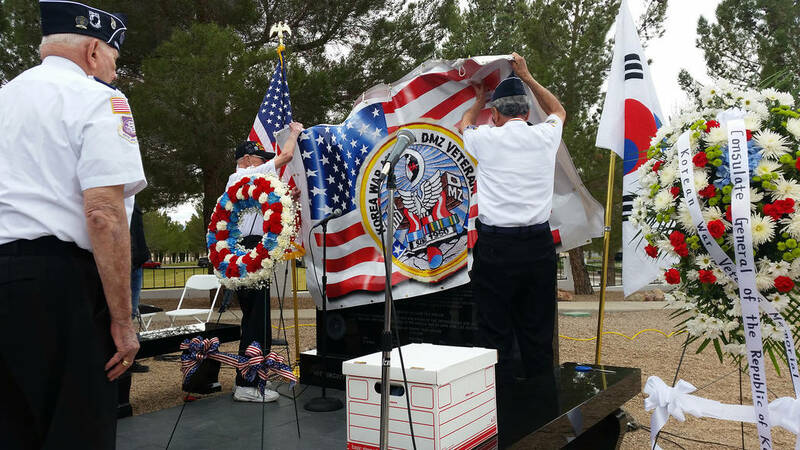 The Korean War veterans buried at the Southern Nevada Veterans Memorial Cemetery in Boulder City were recently welcomed home with a new memorial. Celia Shortt Goodyear/Boulder City Review Retired U.S. Army 1st Sgt. 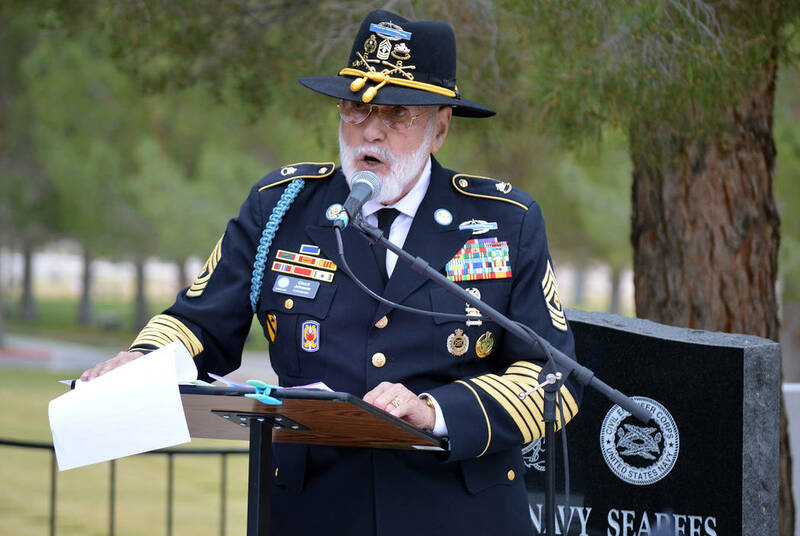 Chuck Johnson opens the dedication ceremony for the Korean War memorial at the Southern Nevada Veterans Memorial Cemetery in Boulder City on Saturday. Celia Shortt Goodyear/Boulder City Review A memorial honoring veterans of the Korean War was unveiled in the Memorial Garden at the Southern Nevada Veterans Memorial Ceremony in Boulder City during a dedication ceremony Saturday. 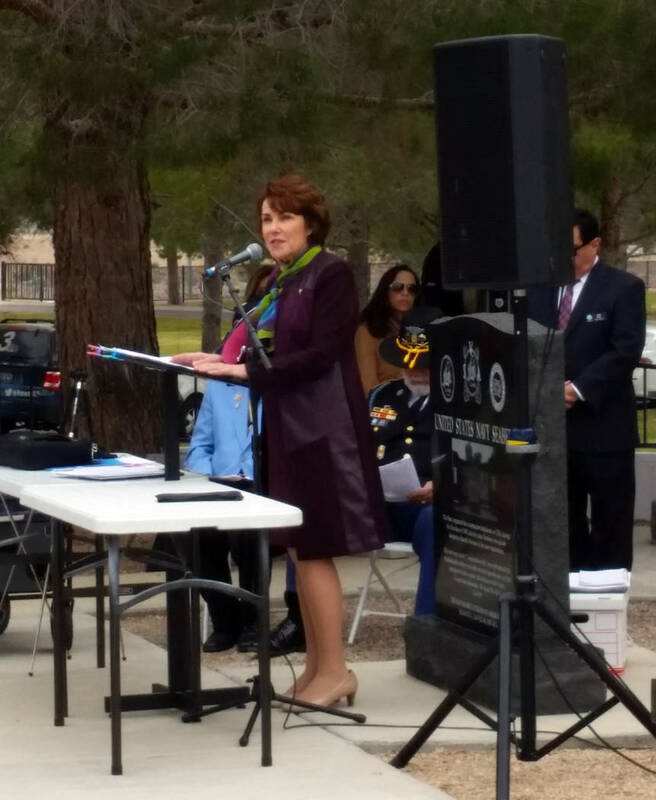 Celia Shortt Goodyear/Boulder City Review U.S. Rep. Jacky Rosen speaks at the dedication ceremony for the Korean War memorial at the Southern Nevada Veterans Memorial Cemetery on Saturday. Celia Shortt Goodyear/Boulder City Review Members of the Korean War Veterans Association Tibor Rubin Medal of Honor Chapter No. 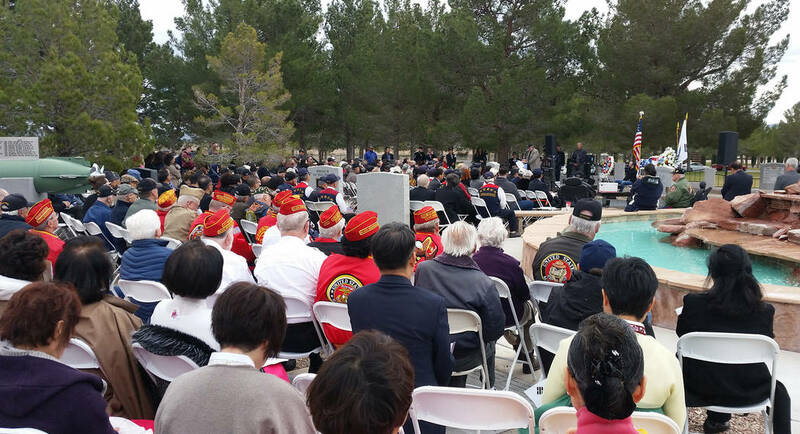 329 in Las Vegas unveil the new Korean War memorial in the Memorial Garden at the Southern Nevada Veterans Memorial Cemetery in Boulder City on Saturday. 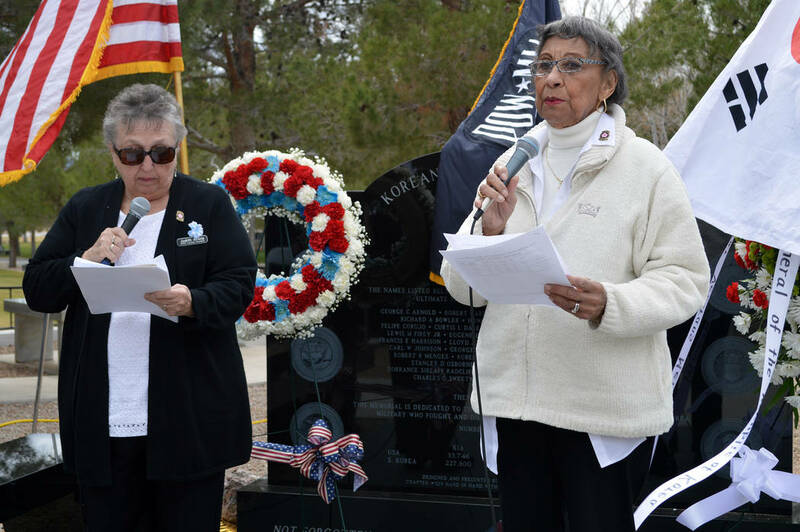 Celia Shortt Goodyear/Boulder City Review Iris Keels, right, and Judy Ariola read the names of the 37 Nevada service members who died fighting in the Korean War at a ceremony to dedicate a new memorial Saturday. 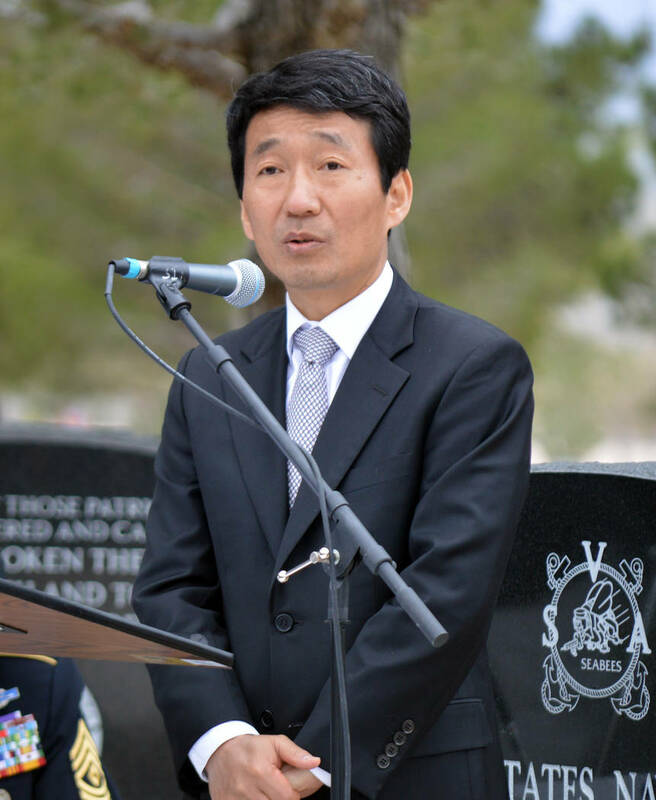 Celia Shortt Goodyear/Boulder City Review Counsel General of the Republic of Korea Kim Wan Joong delivers the keynote speech at a dedication ceremony on Saturday for a new Korean War memorial at the Southern Nevada Veterans Memorial Cemetery in Boulder City. 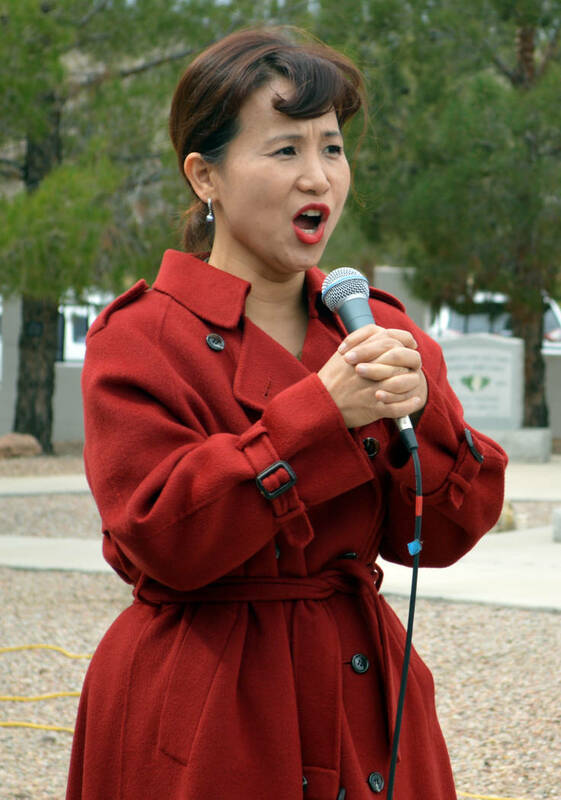 Celia Shortt Goodyear/Boulder City Review Eun Hee Kim sings the Korean national anthem Saturday during the dedication for a new Korean War memorial at the Southern Nevada Veterans Memorial Cemetery in Boulder City. 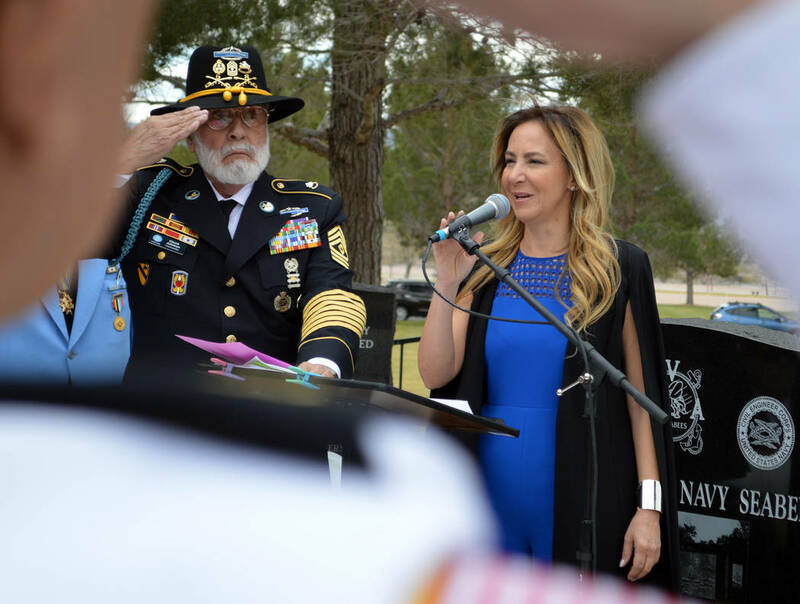 Celia Shortt Goodyear/Boulder City Review Christy Molasky sings the national anthem at the dedication ceremony for a Korean War memorial on Saturday at the Southern Nevada Veterans Memorial Cemetery in Boulder City. 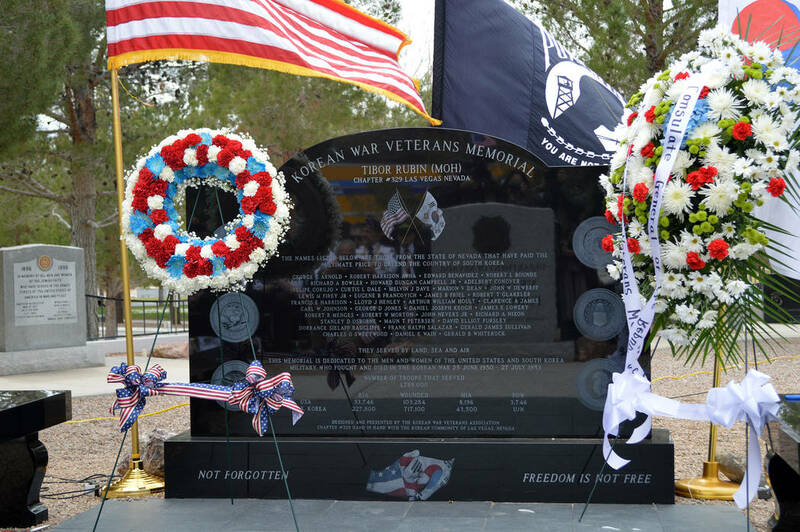 Celia Shortt Goodyear/Boulder City Review More than 250 people attend the dedication ceremony for the new Korean War memorial in Memorial Garden at the Southern Nevada Veterans Memorial Cemetery in Boulder City on Saturday. Johnson was a teenager when he joined the United States Army in 1950 to fight in what has been called by many as “The Forgotten War.” While fighting in Pusan, South Korea, he and other forces were overrun by Chinese troops, and there was a group of guys who could not get out. As commander of the Korean War Veterans Association Tibor Rubin Medal of Honor Las Vegas Chapter No. 329, he helped spearhead creation of the memorial for the veterans cemetery, where more than 9,000 Korean War veterans are buried. The 7,220-pound monument with benches, brickwork and a walkway was unveiled by the association and members of Las Vegas Korean community. It lists the names of the 37 Nevadans who died fighting in the Korean War, fought from June 25, 1950 to July 27, 1953, and honors all veterans who fought in it. The program also featured honored guests including U.S. Rep. Jacky Rosen, Korean Association of Las Vegas President Oliver Lee, and Nevada’s Director of Veterans Services Kat Miller. Counsel General of the Republic of Korea Kim Wan Joong was the keynote speaker. “It is my honor to be here,” said Rosen, who has known Johnson for 25 years..
“When the Korean War veterans came home, it was to silence. … They got on with the business of the their lives,” Miller said. She thanked those veterans for their service and for coming to the aid of people thousands of miles away who they did not know. “The people of Korea are forever thankful to the Korean War veterans,” Lee said. Joong commemorated the hard work of both groups in bringing the memorial to the cemetery and the work of the veterans who helped Korea during the war, as it is now a thriving democracy with a top 10 economy in the world. Saturday’s program also featured the singing of the United States and Korean national anthems as well as a special reading of the names of the 37 Nevada service members who died fighting in the war. The Korean War Veterans Association is a nonprofit organization and has members from all over Clark County. They visit schools to speak about the war as well as having social events for members. For more information about the group, email kwvalasvegaschapter329@gmail.com or go to https://www.facebook.com/Korean-War-Veterans-Association-Las-Vegas-Chapter-329-1982235638676841/.